Home > Apparel, Bags/Totes, Etc. Comfy electric blue hats, perfect for errands or exercising out side. Headbands with the 'fp' logo. 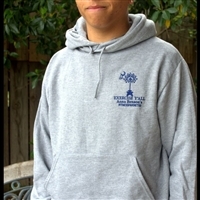 Grey Ash Sweatshirt, with our weighted Palmetto Tree logo! Purple computer tote with the 'Palmetto Weighted Logo', perfect use for laptop and files. Outside pocket with an over the shoulder carrying strap. 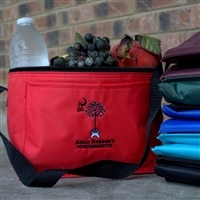 Lunch Totes-great for snacks and lunches. Keep a tote with snacks when out running errands or pack a healthy lunch for a picnic or for the office. Insulated to keep food warm or hot. These canvas bags have multiple uses, from an overnight bag to tote bag to the beach. 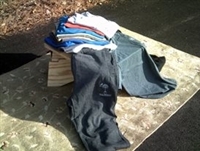 Our cotton T-shirts with weighted Palmetto Tree Logo. Yoga pants, slightly below the knee, Monogrammed with our famous 'weighted Palmetto Tree! ', these pants are comfortable! Might not want to take them off!